Really great post. Looking forward to more like this. Very interesting stuff. One nit pick if I may, shouldn’t the the correspondence of the Either type in logic be the logical XOR as opposed to the logical OR? As far as I know, Either a b can never be both, a and b. @Peter: I guess I have oversimplified it. 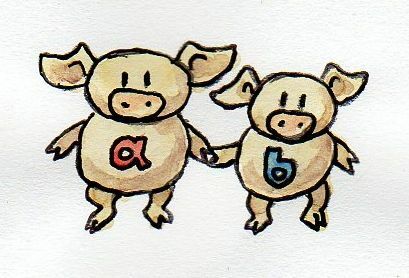 Let me rephrase it: The type Either a b is inhabited if any of the two types a or b are inhabited. Which is also true if both are inhabited. The only uninhabited case is Either Void Void, which corresponds to False || False. I’ll edit the post accordingly. Does anybody have a solution to the idea to make an ADT in C++? The best I come with is having a base class that plays a role of type constructor, i.e. it have a constructor that calls a constructor of «derived» classes, and adds the created class to an internal union with pointers. The method «area()» in the exercise would then check which one member active in the union, and call their «area()». One can’t do area() to be a pure virtual, because then you couldn’t use a constructor of the «base» class. And no need for inheritance here, actually. And it is a horrible solution, at least because one could just use a «derived» class separately. Also, if data constructors signature the same (i.e. it’s two constructors that takes exactly one integer), you probably need to add one more argument to find which one ought to construct the «type constructor». Since C++11, std::string and other types with non-trivial special member functions are allowed in unions. I’m struggle with one little thing. Suppose, I have a coproduct «Either a b». Thus I have two arrows, a “a → Either” and “b → Either”. So far so good, but the problem is that by definition of coproduct we should have at least one “NotACoproduct” type, with arrows a → NotACoproduct, b → NotACoproduct, and Either → NotACoproduct. What is this type NotACoproduct, and most importantly, why don’t you mention it? Could it be easily omitted? You see the pattern? You branch on the two possibilities and apply the corresponding injections. I’m wondering though: why is the requirement to have that second not-a-coproduct type? Does it have an actual reason, or it’s just happened to be like this? To me it seems like we could remove that requirement, and Either Int Bool still would have worked. The requirement is not that a not-a-coproduct type must exist. The requirement is that for every such type (if it exists) there is a unique factoring through the actual coproduct. That’s the essence of every universal construction. Thank you! Category Theory is pretty inaccessible for me as a software engineer without a solid math background, and your posts are incredibly indispensable to me! I’m working my way through them sequentially and I am excited about working through them all! will work just fine with the compiler validating whether the types are correct. And yes, variants are mutable if not const. It seems to me that these are very different from each other because pattern matching needs the real type at the call site to work but vtable have as you say a hidden tag which means the caller doesn’t need to know the tag to use the object. The decision was taken at initialization. I think in haskell, existentials are the nearest concept to this kind of construction. pattern matching would be more of a switch on steroid. In Haskell, pattern matching needs the type, but the variant information is not encoded in the type. It’s encoded in the hidden tag. In C++ the information is originally encoded in the type, but once you erase the actual type and cast the pointer to the base type, the information is stored in the hidden tag — the v-pointer. The theories behind sum types and subtype polymorphism may be different, but they serve similar purpose. Great article and a great series of articles! From what I think I have understood, natural numbers also form a semiring, not a ring, as additive inverse is not defined for natural numbers. As in, it is also a ring without n.
Do let me know if I’m wrong, as that means I have misunderstood something important. By “invertible” you mean just that, two arrows that link two objects, but in opposite directions, correct? It has nothing to do with being an invertible function, because “isomorphism” applies to any category, including those that do not involve functions. Just a pair of arrows in opposite directions. However, in this challenge, it seems you want to see not only an invertible morphism, but an invertible function, a one-to-one correspondence between “Maybe a” and “Either () a”. I say that because, if you just mean a pair of morphisms in opposite directions, then the fact that these types are “Maybe a” and “Either () a” seems completely irrelevant. Any two types A and B that are not Void are isomorphic because there is always an isomorphism between A and B, namely that consisting of a pair of functions f: A -> B and another g: B -> A. g does not need to be the inverse of f. Any such pair of function will do because they will form a pair of morphism in opposite directions and this will, according to your definition, be isomorphic. So you might as well have stated the challenge simply as: “Show the isomorphism between any two non-empty types”. But, like I said, it seems patently obvious that you want a proof that there is a one-to-one correspondence between the elements of “Maybe a” and “Either () a”, but at the same time you are asking for an isomorphism and isomorphisms have nothing do to with invertible functions. Am I missing something? Thanks again. Invertible means they are the inverse of each other, that is g.h = id and h.g = id. This definition works in any category. Hmm… Sorry, I don’t see how that answers my question. Yes, that is the definition of invertible morphism. But your challenge seems to refer to a different notion of invertible, namely invertible function, rather than morphism, because it provides the specific types. Or are the specific types irrelevant? Could the challenge have been stated as “Show the isomorphism between any two non-empty types” and involve the exact same steps in its proof? The definition of isomorphism works in any category, that means also in the category of types and functions. Implementing the two functions is pretty straightforward. The challenge is to show, using equational reasoning, that they are the inverse of each other. But that’s the thing! To show they are isomorphic in category theory, there is no need to do equational reasoning or even to consider what types they are! Both types are non-empty. Therefore, there is some function Maybe a -> Either () a., for example the function mapping any element in Maybe a to the value (). So there is a morphism from Maybe a to Either () a. Likewise, there is a function Either () a -> Maybe a, for example the function mapping any element to (). Therefore there is a morphism from Either () a to Maybe a. Therefore, there is a pair of morphisms between these types and they are isomorphic. Note that at no point in the above proof did I need to use any knowledge about Maybe and Either. I just used the fact that they have at least one value. I could have written it for any other non-empty types A and B. Note that I picked trivial functions that are not the inverse of each other, and it still all works at the category theory level. Sorry to insist, but it seems we may be talking past each other here and maybe I am missing something important. What do you mean “it works at the category theory level”? What’s the composition of the two morphisms? Can you show it’s id? My understanding is that an isomorphism “at the category theory level” is simply a pair of morphisms on two objects, going in opposite directions. The definition doesn’t mention “ids”. In fact, I am very surprised to even hear about an id at all. I didn’t know arrows (morphisms) had ids. Isn’t the whole point of category theory that we just have “objects and arrows” without regard for their inner structure? If I understand what you mean by id, the identity of the morphisms I was talking about are what I described above: a pair of functions mapping one element in each of the types to some (arbitrary) element in the other type. This forms a pair of morphisms in opposite directions and therefore an isomorphism, according to my understanding of the definition of isomorphism in categories. But these functions are not the inverse of each other and we don’t need to know that these types are Maybe a and Either () a in order to define them. Hopefully that clarifies things further. Thanks. I thought some more and identified the source of my misunderstanding. You say “An isomorphism is an invertible morphism; or a pair of morphisms, one being the inverse of the other”, but what “invertible” means in categories (not just in the category of sets and functions) was not explicitly defined. I looked up the definition of isomorphism and found out that it is a morphism f such that there is another morphism g and the composition of f and g is the identity morphism. But my understanding of “identity morphism” was that it was any morphism linking an object to itself. and then interpreting “same arrow” to mean an arrow linking the same nodes. And then this led me to believe that any pair of morphisms between two objects would form an isomorphism, which in turn led me to conclude that any two non-empty types are isomorphic because there is always such a pair between them, which in turn led me to believe that, in that challenge, whether the types were Maybe a and Either () a was a completely irrelevant fact. Actually this hints at something deeper, which is that saying “a category is just objects and arrows” is misleading. Just giving someone some objects linked by arrows does not tell someone, for example, about the isomorphisms in it. One needs to also be told what the composition operator is, and which morphisms linking a node to itself are to be considered identity morphisms, to check whether two morphisms do compose into the identity morphism. I hope this is not too long, but this was a pretty tricky confusion for me, especially the paragraph above, so it might also be for someone else. Rodrigo, In the chapter Category: The essence of composition I explicitly say: “But the essence of a category is composition.” Maybe I should have stressed the fact that there may be many looping arrows, and only one of them is identity. This becomes obvious in the next chapter that describes monoids. Yes, now I see it. 🙂 Thanks!